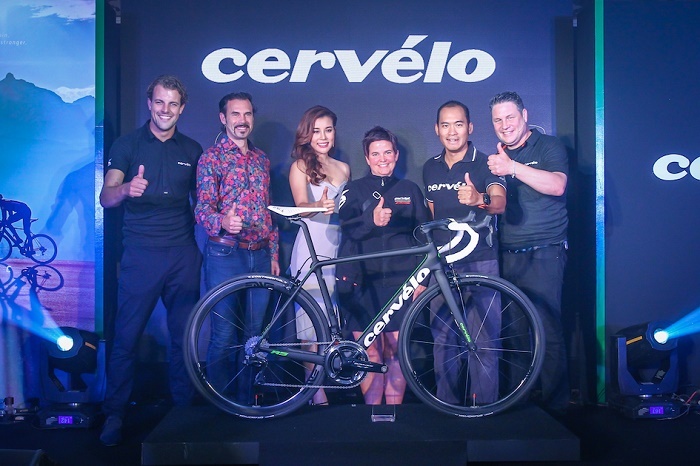 Mr. Kongpan Pramoj Na Ayudhaya (second right) Managing Director, Bike Zone Co., Ltd. recently held the launch of Cervélo New R Series with the presence of Mr. Phil White (second left) Co-Founder of Cervélo Cycle Inc., who gave a speech on reinventing the classic R Series. Mr. Phil Spearman (right), Global Product Manager Ms. Lesley Loughlin (third from right), Marketing Manager Triathlon, Mr. Berend Kistemaker (Left), Head of Sales Asia, Cervélo Cycle Inc., and Aroonnapa Panicharoon (third from left), Cyclist, attended the event at Anantara Siam Hotel. Bike Zone Co., Ltd. is a leading bicycle and bike accessories importer and distributor specializing in high performance road and triathlon bikes and gear. We are Thailand’s leader in triathlon market with three of the world’s leading triathlon bike brands exclusively under our portfolio and multiple sponsorships of individual triathletes, teams and triathlon races.